WHERE IS THE PINK COW? How is Dr. Sketchy’s different from a normal life drawing class? In normal life classes, silent students sit in a silent room and draw a bored, oft-uninteresting model. In Dr. Sketchy’s we’ve got scandalous performers as models. We’ve got ridiculous art contests (best incorporation of a woodland animal? Best imagined costume? ), comedic skits good music and flashy prizes. We’ve got a selection of posh beverages- alcoholic and not- available to buy. At Dr. Sketchy’s, we don’t care if you picked up a pad yesterday or 50 years ago. Come to drink or to draw. We’re happy to have you. Is Dr. Sketchy’s just in Tokyo? No! Molly Crabapple our fearless founder began Dr. Sketchy’s in 2005. She even wrote a book about it. The original Dr. Sketchy’s is still going strong in New York City. There are Dr. Sketchy’s is in 50 cities and 4 continents around the world. 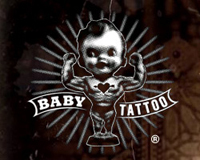 To find information about a particular Dr. Sketchy’s branch, check out their site. How often does Dr. Sketchy’s take place? Dr. Sketchy Tokyo is a bit in flux since the earthquake. But we plan on keeping it a monthly event! Check the event details for better info!!! What mediums can I use? Are there easles? Tables? Sketchpads? There are very limited tables, and limited space. Sorry to say but in Tokyo you’ve gotta be prepared to be a bit cramped when enjoying a grass roots event! If you don’t want a table or are too late to get one, there are plenty of chairs and stools to sit on. If you stumble in an hour late, all the seating will probably be taken and you may have to sit on the floor. Moral? Be on time. It’s the Japanese way! We sell sketchpads and pencils if you forget em. Hey, why isn’t the model naked? I thought this was life drawing! Tokyo has an ordinance against naked girls and drinking in the same room. Besides, Dr. Sketchy models show more than enough flesh to get in all the latissimus dorsi and pectoralis major you might desire. I did a great drawing at Dr. Sketchy’s. Can I send you a copy? Post it on our Facebook and Mixi sites. We are working on figuring out a message board system. Unfortunately Lady Elle isn’t that tech saavy. She is more than happy to take any help you can give in that department. I’m a photographer. Can I shoot pictures of your hottie models? Maybe. Dr. Sketchy’s has an official photographer, Buddy Jiang. While we love photography, we’ve found the needs of photographers can be antithetical to those of artists- and a flash is downright distracting. We also think that models should get paid more posing for photography and we don’t have the dough. However, you’re welcome to shoot us a line with your portfolio. If you’re press, of course you can take photos. If you take photos without permission, you will be kicked out, with no refund. Models are not zoo animals. I have entitlement issues and want to take them out on the Dr. Sketchy’s staff. Can I yell, be rude or cause a scene? No. Rudeness to any member of the Dr. Sketchy’s crew will lead to immediate expulsion, without refund. We suggest you adopt a nicer attitude towards service people. INFORMATION FOR MODELS, HELPERS, SPONSORS and OTHER SAINTS (TOKYO SPECIFIC). Dr. Sketchy’s sounds cool. I wanna model? What’s the deal? Dr. Sketchy’s is always looking for models. As this is Dr. Sketchy’s Tokyo, we prefer to have Japanese models. However, we will consider anyone who has talent! If you are a: burlesque dancer, circus performer, little person, contortionist, female body builder, drag queen, professional ballerina, aerialist, or other person with unusual physiology, insane costuming or extreme physical skills, I would still like to hear from you. We rarely book men, but if you are a handsome, muscular young guy who’s comfortable posing with women and doesn’t creep them out (professional dancers preferred) we can keep you in mind. To apply, send a bio, a low-res photo or two and a link to your website to toby@drsketchytokyo.com . Models must be comfortable having their photos and likenesses used in Dr. Sketchy’s advertising and projects. Dr. Sketchy’s sounds cool. I own a small business and want to sponsor you. Tell me some details. Well, you’ve come to the right place! We’re always looking for sponsers. Donations of cash, prizes, or printing will get you a logo on our poster, prominent placement on our website, mention in our monthly newsletter, on stage shoutouts, and eternal love. Email toby@drsketchytokyo.com and find out more about how sponsoring us can help spread the word about your business. Dr. Sketchy’s sounds awesome, but I don’t live in Tokyo. How do I get my fill of dirty life drawing? Ask permission to start your own Dr. Sketchy’s. Even if you live in Akita, all you need are a few artists, a hot model and a dream. Click your way over to the Start Your Own Dr. Sketchy’s page. If you use this to start a session, but call it something else, you’re not a very nice person. I want to help out at Dr. Sketchy’s. Need any helper monkeys? Yessiree! If you want to hang flyers, haul chairs, post on message boards, do graphic design, hand out postcards or spread the word, drop us an email. We will shower you in free swag, invites to exclusive events, and our hot, sticky love. 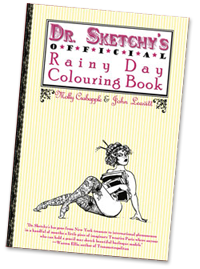 When’s the Dr. Sketchy’s Official Rainy Day Colouring Book coming out? It’s out now, so go buy a copy!